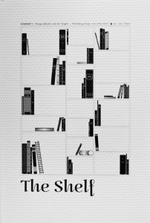 The Shelf Journal is a french bi-annual review on publishing design and book design. Part place of worship and reflection for paper lovers, part experimental platform for designers, typographers and other graphic designers, the Journal explores the essence of our libraries’ charm: the limitless variations in form of this unique object. In the first issue — Off the Shelf: Tristan Pernet, Le trident francophone / Colin Caradec, Préposé aux chevaux vapeur — Shelf Service: Paul Disjtelberge, On loving books / Nick Sherman, The Design of Type Specimens — Me my Shelf and I: Pierre di Sciullo, Entrevue — Display Shelf: W. A. Dwiggins, The Structure of a Book — Shelf Mark: Paul-Marie Grinevald, Les voyages de découvertes (1750-1850) — Shelf Label, What was the last book you bought for its visual, physical or artistic quality?